The ladies of Little Mix let us in on a secret: their third album is going to be all about the 80s. Later that night, Nelson and the rest of the chatty foursome will take their tangible chemistry to the stage for a swift, high-energy performance at the launch of X Factor Middle East in Dubai. It’s no surprise the girls are so in tune with one another, both on and offstage. They’ve been virtually attached at the hip since 2011, when they became the first group to win the X Factor UK. The following year, they released their debut pop album, DNA, followed by an edgier sophomore attempt, Salute, which called upon the sounds of 90s girl groups TLC and Destiny’s Child. But their upcoming 2015 release is all about the retro vibes, they tell us. It’s inspired in part by living legend Prince. “It’s very 80s, so it’s a whole new sound we’ve gone for. We love trying new things and experimenting and taking risks, that’s what we’re all about,” Nelson says. 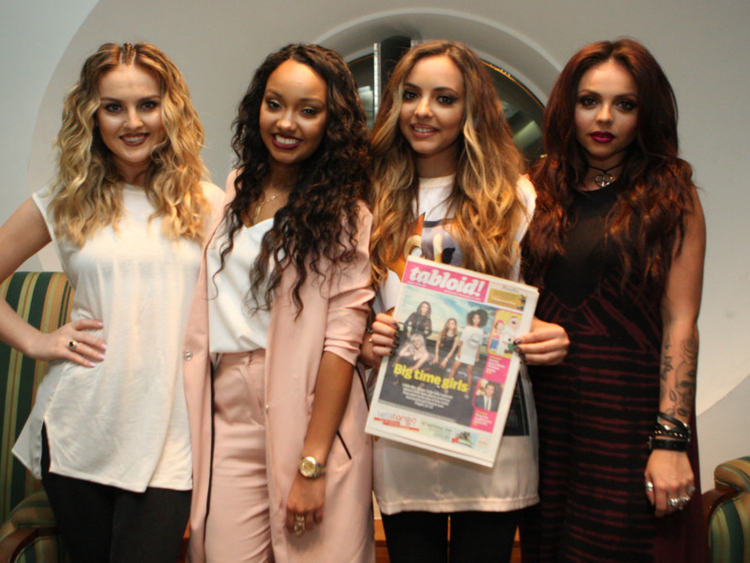 On her right, Perrie Edwards adds that it all comes down to their love of the era’s music. Whatever magic they’re up to in studio, the four seem to be in good spirits about it. In between spells of laughter and banter, Nelson, Pinnock, Edwards and Jade Thirlwall tell us all about their first impressions of each other, the support of their significant others and why they have a love/hate relationship with make-up. Let’s rewind to when you were first put together on X Factor. Were any of you intimidated one another? Jade: I was just in awe of your beauty. I’d never seen anyone that looks like you before. Leigh-Anne: I remember hearing Perrie and thinking, ‘This girl’s got chords on her.’ What’s that thing? Pipes! That’s the word. You’re clearly comfortable with each other now. But what makes you cranky? Perrie: I feel like we all know each other’s boundaries now. We know when to not push, when to push. When we’re tired, we know to leave each other alone. Jesy: Yeah! Sorry to interrupt you, babe. When we’re all tired, we can either be really delirious and silly and we don’t care — we’re just absolutely mental together. Or some of us can be delirious and some can be really annoyed. It’s too much, sometimes, and that aggravates us. Perrie: We’re always together. We don’t really irritate each other that much, because we know when to step back. Other than that, we’re always in each other’s faces. Are all of you in relationships at the moment? Do you find it nice to have that extra support? Does it make you want to go home more often? Jesy: Well, I don’t know. For me and Perrie, obviously, we both have boyfriends in bands, where they’re on the road a lot. Perrie: Finding a time when we’re both off, we’re both free, is difficult. Jesy: It’s really hard. Obviously we miss them so much, but at the same time, it’s so nice to have boyfriends who are in the same industry and get it. In general, all our boyfriends are so supportive. Perrie: And they want us to do well, as well. They want us to succeed and they’re so positive about everything and give us advice. It’s really sweet. Jesy: Some boys could find it quite intimidating or wouldn’t be able to handle it, but I think we’ve all found the right one. Perrie, your fiancé [Zayn Malik of One Direction] is going to be here in Dubai with the boys next month. Perrie: Yes! I really wanted to come, but we’re so busy with the album. You’ve beat him to it. Do you two text each other and exchange notes about where you’ve been? Perrie: Yeah! I think, when you’re in a relationship that’s kind of long distance a lot of the time, you’ve got to talk all the time. Keep each other updated, even if you’re going to be busy all day. Just say, ‘Look, I’m going to be busy today, but I hope you’re all right.’ You’ve got to keep in contact. Otherwise you kind of lose the, you know — ah, you become desperate! You’re in Dubai for the launch of the X Factor, but can we expect a proper show here soon? Jade: We’d love to. We want to do a world tour and go everywhere, because we have so many fans all over the world that we never get to see. We’ve got a lot of Middle Eastern fans, haven’t we? And Jade, of course, you have Arabic roots. Do you speak any Arabic? Jade: Oh, no. I can say hello and ‘salaam alaikum’ and all that stuff, but nothing impressive. I want to learn Arabic again. I knew it when I was little. You’ve got a make-up line, as well. Do you enjoy dumping your make-up out in front of the mirror and doing it yourself? Jade: I love doing that. Jesy: No, I’m [expletive] awful! Where we’ve got make-up artists now, we know how we like to look. Trying to do it myself? I hate it. Leigh-Anne: Yeah, trying to do it like a make-up artist is just not going to happen. Well, unless you’re Jade. Jesy: Jade literally is a make-up artist. Perrie: The thing is, like, when I was younger, I used to sit in my room for hours and hours putting make-up on and putting weird things on my face and being all quirky and taking pictures. Now that we do it so often, the novelty’s worn off. I can’t be bothered. Jesy: Like Perrie said, where we wear it so much, to not wear it is amazing. Do you ever fall asleep in it? Jesy: Oh my god, all the time. Listen, we don’t waste make-up. If we’ve had a good [make-up] day, I will try to keep it on. The eye, not the skin. Between you four, is there someone you go to when you’re down? Perrie: I feel like, at the beginning, there would be a certain person you went to for this, and a certain person you went to for that. But now, we’ll go to anyone. Perrie: We’re all just amazing! Do you remember the first time you heard yourself on the radio? Leigh-Anne: It was a disaster. Perrie: We have it on video. Our faces just drop. That would only happen to Little Mix.